For a look that's full of classic elegance, pick this sophisticated ladies' watch from Seiko. Styled in sleek gold toned stainless steel with a feminine gold dial for a look that's timeless. A Swarovski® set bezel adds subtle shimmer that makes this a great way to take any outfit from day to night. 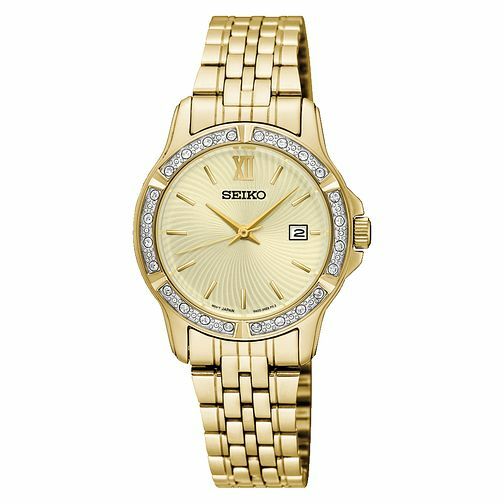 Seiko Ladies' Stainless Steel Gold Bracelet Watch is rated 5.0 out of 5 by 2. Rated 5 out of 5 by Anonymous from Nice looking watch The order process was excellent and was delivered within the expected timescale. The watch was sleek and is very simple to use. Rated 5 out of 5 by Anonymous from Beautiful watch This is a lovely watch. A very good product at a great price.